Marko Đurić is Director of the Office for Kosovo and Metohija of the Government of the Republic of Serbia. 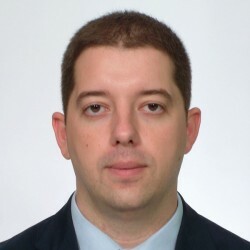 He was born in Belgrade in 1983, and graduated in law in 2010. In June 2012 he was appointed as Foreign Policy Adviser to the President of the Republic of Serbia, coordinating top officials’ activities regarding the international reaction to the 2008 Kosovo declaration of independence, and the preparation of a official Serbian platform for Belgrade-Pristina negotiations in 2012. Many of his important duties also involve daily diplomatic communication and strategic policy planning. Before his appointment, Đurić was a researcher at the Belgrade Institute for Political Studies. He has been a member of the Serbian Progressive Party (SNS) since its foundation in 2008, and previously had not been a member of any party. He sits on the Main Board and Presidency of the SNS.